Capt. Paul Ross and mate Jim Hendrix of Team Relentless have done it again. They competed and won in the 2014 Islamorada Sailfish Tournament! This is leg one of three of the Gold Cup Series of sailfish tournaments here in the Florida Keys. The competition was intense and really boiled down to the final 3rd day of fishing. Team Relentless pulled away in the end winning with 16 fish for the 3 day tournament. Capt. 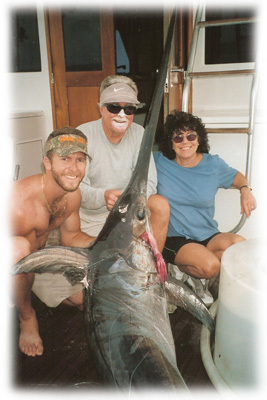 Paul has a long history of winning big time tournaments here in the keys. Second place was Team Nancy Lee, captained by long-time fellow Bud n' Mary's Capt. Dave Morris, with 15 fish. In 3rd place was Team Olympic Gold, who had a three way tie with other boats, all with 12 fish. It's always great to see how well Bud n' Mary's captains represent in the local Islamorada sailfish tournaments, and not to mention many other tournaments around the world - Great job guys! You can book all of our tournament-winning captains through our office, the winter time is the BEST time of year to catch that sailfish of a lifetime! Call us today at 305-664-2461.